Well, it's been a while. I've waved farewell to the previous gig, which proved to be a suitable venue to demonstrate my C abilities, with even some modest measure of assembly, speeding up the core event processor by around eight times, for greatly improved latency. Hey, I should do this for a living! As a few of you may have noticed, I've taken my photography a little more seriously since last time I posted. (Not seriously, one should understand - it's way too much fun =:) I'd been enjoying the TZ5, but I couldn't shake the feeling that at full zoom - where I usually was, for wildlife - the effective, useful resolution wasn't anywhere near 9MP, with the noise level rendering full resolution somewhat useless. Then there were other obvious aspects, like being unable to play with shallower depth of field beyond macro shots, or even having direct control over shutter speed, making it very difficult to catch action shots. And then the coworker brought in his new Sony A380. I took it out for a spin. And thus began my quest for knowledge, learning about the manifold lens mounts - different for just about every manufacturer - the way Nikon and Canon keep stabilisation in the lens, whilst all others move the sensor, the virtues of RAW vs JPEG, and just what the essential differences are between the various models in each maker's lineup. And indeed, it is very good. No chromatic aberrations - color fringing, especially noticeable with sharp contrast boundaries - I can see, and nigh perfect acuity, even from across a field's length. Very fast (and quiet) focus, too, though the D90 might let it down now and then, as it seems the adjustment in AF-C (continuous autofocus) mode isn't always as fast to respond as it might be - again, one of those characteristics that improves with the pro bodies. But what can it all do? I'm happy. ^_^ I enjoyed the TZ5 for a year and a half, but could never quite shake the sense that, at full zoom - where, inevitably, I usually was for my wildlife photography - the noise level was simply quite high, effectively reducing it to a 2MP camera or thereabouts, not to mention a subtle lack of realism. The TZ5 is nonetheless quite an accomplishment of technology, and certainly cheaper and lighter - but, no question, the above are worth the tradeoff. First up, a remarkable short, "The Third & The Seventh", by Alex Roman. It's Baraka of a world that never existed, for every frame is, unbelievably, purely CGI. It's gentle, and unutterably beautiful; I was in tears in awe. If anyone's had the good fortune to enjoy the BBC production of The Box of Delights (partly filmed in the proverbial back yard of our esteemed loganberrybunny!) - and if you haven't, I must recommend it most heartily - then you might be interested to learn that Mike Newell (Four Weddings and a Funeral, Harry Potter and the Goblet of Fire", et al) and Frank Cottrel Boyce (Code 46, Millions) will be bringing a new version to the big screen, possibly this year. ^_^ "'I first heard 'Box of Delights' as a radio play on the BBC when I was a boy,' Newell said. 'I was immediately seduced by the tingling, opening harp music and the fantastical, mysterious, magic story that followed.'" The production company, Brilliant Films, is a recently formed venture, with directorial talent including Mike Newell, Martin Campbell (Goldeneye, Casino Royale), and Duncan Jones (Moon) - so they're emphatically not lacking in cluefulness! It's possible, however, that the project has sunk into Development Hell™, as there doesn't seem to be any news later than that announcement; I've asked their PR peeps for comment, so perhaps there'll be illumination yet. Here's a discussion about the reasons people do, or indeed, don't, use an avatar of the opposite gender in SL. It does, unfortunately, get a little rocky at points, as some of the landmines get set off, but it's a worthwhile thread for all that. What about you? I should like to direct your attention to timberwoof's guide to transformative bloodborne pathogens. For a soupçon of political salaciousness, this Top Ten Anti-Gay Activists Out of the Closet, and page 2, is delightful reading, lending credence to the notion that those who bray most loudly against gay equality quite often turn out to be quietly flaming. Quite what compels such people to work with such passion against perfectly normal behavior they themselves understand (or at least, know), I shan't pretend to be able to fathom. Quite an absorbing look into Japanese bladesmiths making unparalleled kitchen knives, with many good photos. Not a sterile article by any means - this is more of a travelogue, looking closely at the processes and the people. iFixit released repair manuals for the major game consoles. An excellent site to visit for other repair manuals, whatever the device - they cover various branches of electronics, having originally started with Apple's wares, but branched out in 2010 with the aim of offering any and all repair guidance they can. Finally, a shot I took a few days ago..
Wow, I was wondering just yesterday where you'd got to. :) Thank you, as ever, for so much diverting material. BTW, did we just miss each other hereabouts? Hey, you came back! I've been wondering whatever had become of you. 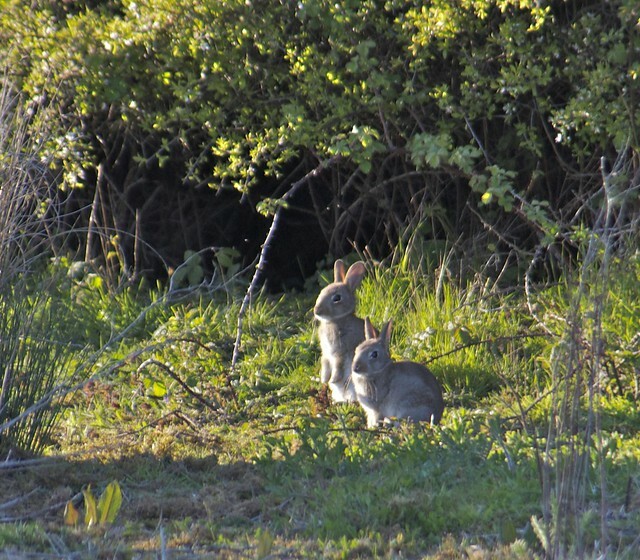 And you brought so many lovely rabbit photographs, too! The first two are absolutely fantastic. It's nice to see rabbits acting like rabbits and not just sitting there. I'll have to look through your plethora of links when I have a moment to myself, but it's great to see you back around the place. It's one of those things.. I sort of felt I'd been spending just much too much time with LJ, with no real happy medium available, only a choice of culling the friends list badly, or not actually paying any attention to what everyone was saying. My choice was no better, of course, but I didn't really feel the stressful atmosphere of the last gig worked at all well with properly involving myself - I suppose I felt there wasn't really any other option. 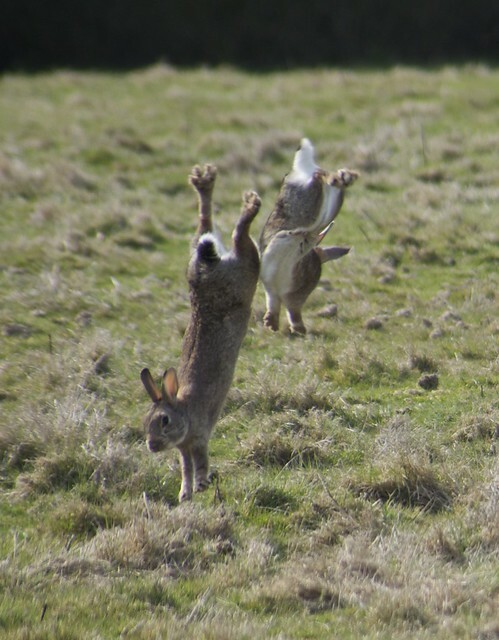 Those are some rather spectacular bunny action photos! Excellent timing firing off the shutter. Nice to see you still around LJ too. It's quite a feat, keeping ready for just that moment, when they seem like they might be about to react to each other - sometimes with a chase, but often more complex than that. It's all down to body language, of course, given I'm well out of range of their scents, and surely wouldn't understand them anyway. This is, I suppose, the benefit of having watched them for that long. ^_^ The job itself had, shall we say, shortcomings, but being just a few minutes' walk from the buns every day was something very special. I'd be out there every day, whatever the weather, and they would be too - only a couple if the rain was heavy, but even then, there'd often be one or two huddled close to the hedgerow, doing what they could without getting completely soaked. On my final day by the trail, having enjoyed their company so much, I cried a few times. Wherever I find myself next, I'll always have a special pace in my memories for that lot - crazy, cute, fast, adorable, curious. I did, finally, bring along a big bag of raisins, and scattered them along the trail edge. Viva Lapinity! I'd love to get my hands on that lens. 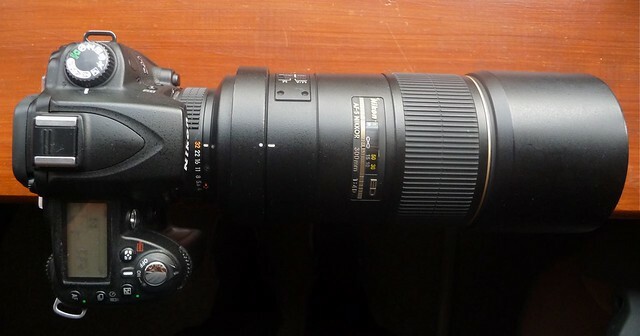 Am I to understand correctly that you're shooting a regular Nikon lens on a DX body, effectively making that a 450 mm? Those rabbit shots are just delicious. Thanks for sharing, and glad you're back! Just so. ^_^ It really is as good as all the reviews say - pretty much perfect, as far as any real lens can be. ^_^ I've got a rather nice voop shot on Flickr, cropped down quite a bit, that's still perfectly sharp - and he was over 120' away. Just incredible! And if I remember, despite the current finances, I'm looking to avail myself of BorrowLenses' services for the CNY parade next month - what are the odds I'd find myself in the largest Chinese enclave outside China, on the dawn of the year of the rabbit? ^_^ I'm looking at one of their Nikkor 14-24mm f/2.8 - not as wide as the Sigma 8-16, but much brighter, and given this'll all be starting around eveningtime, that'll be particularly useful. Hee! oh, I'll alway be around, somewhere or other. ^_^ I expect I'll be around for good. And wow, that's not a camera, that's a MORTAR!! Welcome back :) And nice shots!! Welcome back! Some good photos there! Thanks. ^_^ *hug* It's good to be back, finally. ^_^ I hope all remains well down on the ranch! 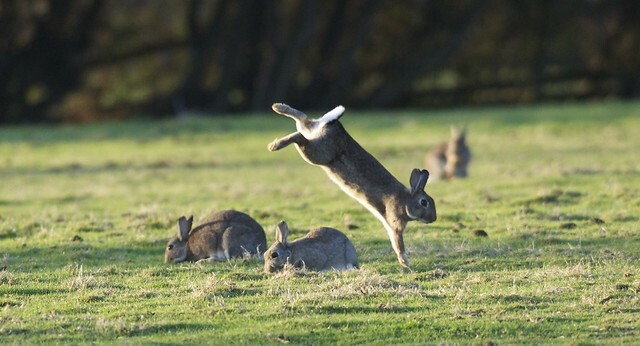 Just love the photo of th' leaping bunnies! It was really one of those magical moments. ^_^ I wasn't even sure I'd caught it at all, as it all happened so very quickly. Just goes to show - what might seem quite routine or fleeting on a human timescale can be so very much more for the participants! 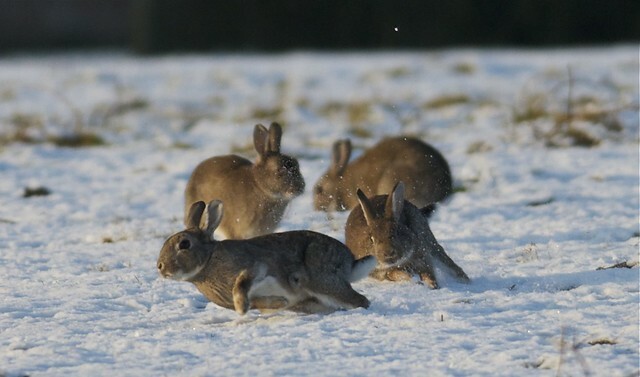 I was so pleased to catch a few good shots of the buns in the snow. ^_^ They're fabulous anyway, but there's just something about that glossy whiteness as a background, and I deliberately pulled the aperture in a bit for greater DoF, to better show off all of the participants. The challenge now, of course, is finding where to try encountering wildlife here! 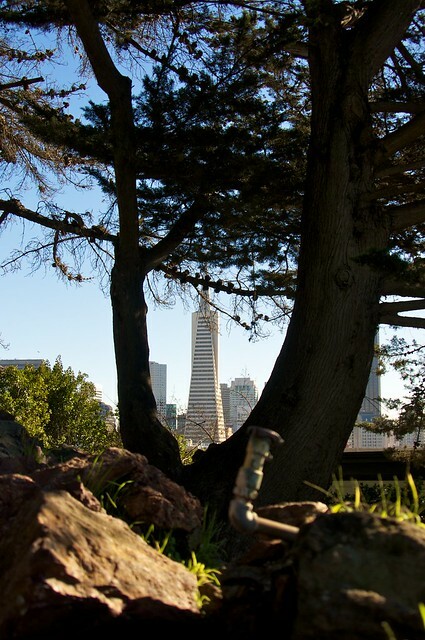 Timberwuf's suggested down in Glen Park itself, and a friend from a previous gig thinks the parks around the Oakland hills would be worth trying. Oh yeah, that second shot is hilarious! SO good to see you again and yes, I'm sure you were on many minds. Now that's what I call a lens! I'm the proud owner of a new one myself, beans and rice for a couple of months nets me a Tamron 70-200 2.8. Yeah, 2.8 all the way through be-aitch!! Awesome light-gatherer for astro-photography. Now all I've gotta do is get this damn polar mount hacked properly. Oh what news I've got! Might wanna spread this one around, and consider it yourself! It's gonna be an historic mad fun event. First adults-only outdoor event? Yep! And it's gonna go down at my house! Now that's a sorely tempting event. If I can make it, I will, but it's all up in the air at this point. There seem to be some good leads locally, which obviously take priority over anything else, though I'd still love to make time for something like this. ^_^ What will actually pan out, of course, remains to be seen.. HR critters are most peculiar sorts. Those are some fantastic photos! Aack! Now that's a bit of a jarring transition. Do you think - as and when finances permit, of course - you might wind up getting your paws on a DSLR of your own? Needn't be new, either.. find one that hasn't seen heavy use (given the shutter mechanisms tend to be rated for around 100,000 actuations - sounds like a lot, but in 2010, with all the bunwatching, I went through somewhere around 30,000! ), and you could save a third or so of the price on a reasonably current model. I'm delighted to see you in these parts again, and all the more so with such fantastic photos. I'm highly jealous, I must say, and really less of your lens than of your results. The second photo in particular has fantastic energy to it. Touching on something you mentioned above, it's perhaps true that LJ's furry component has shrunk a little over the last couple of years. I think a lot of people have taken themselves off to FA (even me, to a small extent) but I'm reasonably hopeful that it won't fall apart in the way alt.l.f did. And to the unaided eye, of course, all we might otherwise see is a quick chase, or maybe a leap - it's only with the magic of photography that we can see just how much careful, incredibly rapid coordination is going on in every tiny slice of each second. I feel so fortunate in having had all that time with them. Ah, yes, FA! I'll likely be waking up there again soon, too, though probably just for commenting/faving rather than journals. Maybe even an artwork submission at some point, now the Intuos 3's pen is but a day away from delivery - despite the lack of funds, I felt it was high time to get the tablet back in action; the pen was lost during the last move, unfortunately, and at the time, a replacement seemed to be around £70+, which has since shrunk to $64. It'll likely be quite handy as an input method for brush enhancements to photos in Aperture 3, too. Maybe I'll post that shot to animaloptica, and see if anyone there can identify it, though I might be better off on a dedicated forum like FredMiranda, particularly given the apparent avian leanings of that forum. Awesome shots as always, and I think the bunnies are getting used to you. You're always there, always sending them love. One of these days, one of them is going to come up and nibble on your shoes. It was quite a wrench, finally leaving the area - the locale as a whole wasn't really where I belonged, yet it was a very friendly small town, and wonderfully peaceful. (The downside, of course, was that it was unutterably peaceful =:) Whilst the job wasn't especially fun, being able to watch their lives every weekday was a truly marvellous way of decompressing during a long day, letting go of the tiny stresses.